As much as I wanted to thru-hike a proper southbound hike, it just wasn’t possible for me to start at Hart’s Pass (the last trailhead which is accessible by road in the US) for a loop to the Canadian border. Since it is illegal for everybody to enter the US from Canada hiking the PCT, all southbounders must start at Hart’s Pass, adding 30 miles to the already daunting total of 2660 miles. By the time of this writing, there is still too much snow to hike safely. The trail is totally invisible, the snowfall and fog makes it harder to navigate, the snow literally slows you down. The weather is unstable and only a handful of people have attempted to make it to the border and back. One thru-hiker slipped from a steep slope last week, fell down and was lucky enough to be saved by a tree that stopped his fall. He was rescued by helicopter later that day. With 4 broken ribs and a severe head wound. He must have had an angel on his shoulder. This made me come up with he following plan: traveling all the way down to the Oregon-Washington border (505 miles south from the Canadian border) and start from the border town Cascade Locks. From there, I will attempt hiking northbound to the Canadian border, and then flip flop southbound to the Mexican border from Cascade Locks. I had been in touch with Edward Intvan for a while, a Dutch trail angel who lives near the PCT in Washington state. He has helped me enormously by getting started. 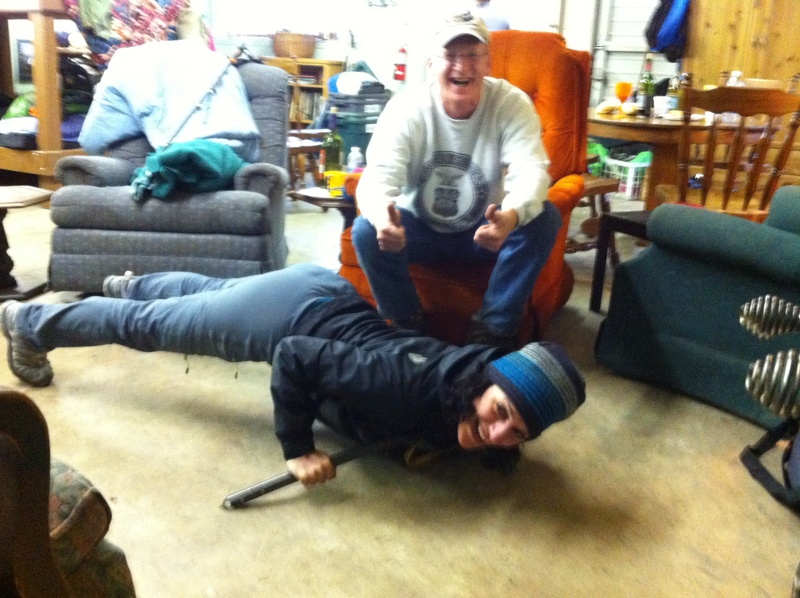 He picked me up from the train station and drove me to the grocery stores, gave me many golden tips and introduced me to several other trail angels, people who have a passion for the trail and it’s hikers and who will go the extra mile to help you with whatever you need. 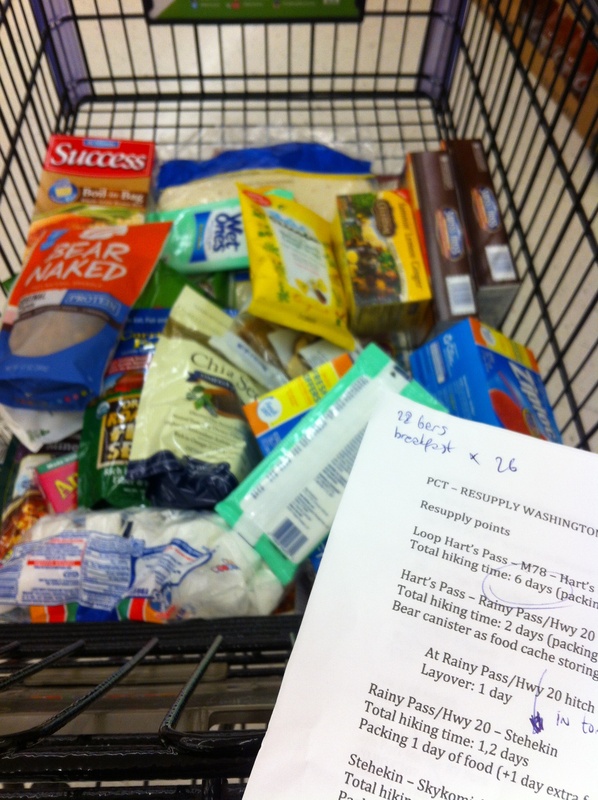 So he took me to the Dinsmore’s in Skykomish where we stayed 2 nights and where I could prepare my food boxes which I then could send myself to towns on the trails which are too small to have an actual store where you can buy your resupply. 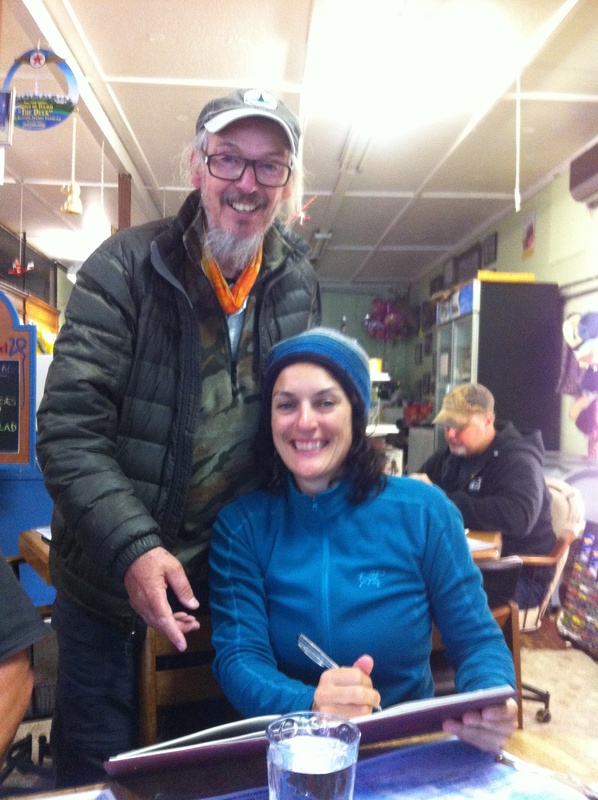 With Edward in The Baring Store, Skykomish, having fun writing in the restaurant’s register. 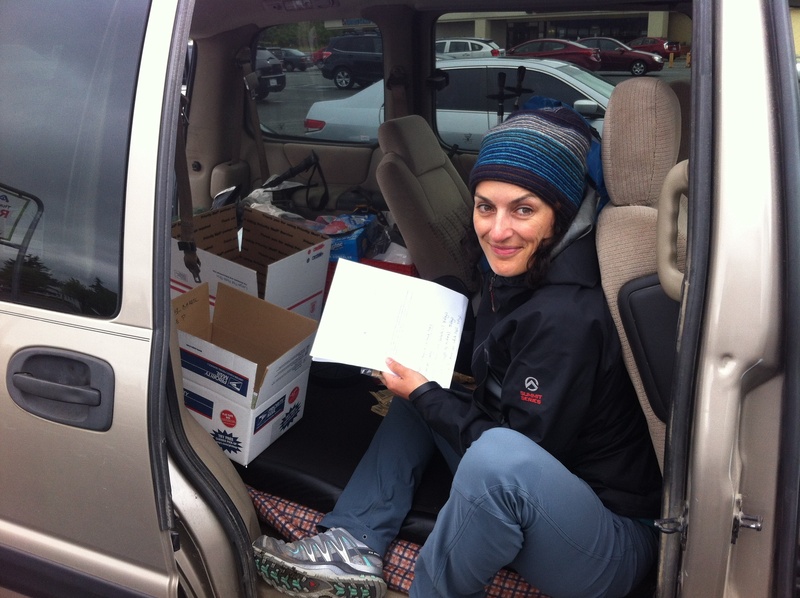 In Ed’s van in the grocery’s parking lot, preparing 26 breakfasts, 26 lunches, 26 dinners and dividing them into boxes. Now I’m totally ready for my first steps on the Pacific Crest Trail! Thank you trail angels! Hi Vi, doing okay? So lovely to read about your ‘path’! I’m trying to follow it on the map, here and there a name of a lake or a campground with, sometimes, an accompanying photo so that I can picture you there. Obviously there are some rough nights too, when you camp where you see fit, ‘ Into The Wild’. Girl, how do you do it?! Seems like you passed Lake Tahoe (a place I know from a long time ago) now? And is or was your Sacramento detour a ‘change of pace/temperature’? Was it nice and did you warm up a bit? Hey Berty! Good to hear from you! I miss you!! Everything is going well, it’s great to be out here doing this! It’s a bit complicated to explain, but first I wanted to start at the Canadian border hiking south toward the Mex. border. But I couldn’t, because of the extreme snow levels. Then, I decided to travel to Cascade Locks, a town that is on the Oregon/Washington border. I walked 82 miles NORTHBOUND to Trout Lake (you can read the story in a new blog post) but also here, a lot of snow (+10 feet, no trail visible). Now, after this exiting hike of 5 days, I travelled way down south to the town of Truckee, CA (via Sacramento), where I started hiking towards the Canadian Border. When I get there (in about 2 months or so) I travel back to Truckee and go southbound to the Mexican border from there. So Lake Tahoe I didn’t see yet. That’s on my southbound route.